Whether you’re already a Google customer or simply getting started with the public cloud, Google Cloud Platform (GCP) is an aordable, reliable, innovative and intuitive cloud solution. 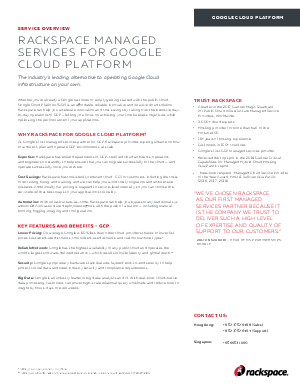 Rackspace can help you accelerate innovation and cost savings by taking over the intensive dayto-day operations of GCP — letting you focus on achieving your core business objectives while optimizing the performance of your applications. Rackspace works with customers to identify the scope and criticality of their applications and determine the service level that best addresses their needs. To discover how, download this whitepaper today.